Our notional executive’s assumption about how industry would help the banks and the economy out of the Credit Crunch was in one element correct. Borrowers had bailed out the banks, but it was only by means of workers’ redundancies, the stripping of the products of their labour, and in not a few cases an enterprise’s utter destruction. The publicised suicides of various businessmen, such as Adolf Merckle and Kirk Stephenson1 barely indicated the suffering that was passing through community after community as employers folded and asset prices collapsed. In the UK, for example, the number of people committing suicide rose by 329 to 5,706 in 2008 – the first increase since 1998. The rate of suicide among men went up from 16.8 per 100,000 people in 2007 to 17.7 per 100,000 in 2008; the suicide rate among women rose from 5 per 100,000 people to 5.4 per 100,0002. Personal bankruptcies were at a record 134,000 in 2009, with under a million more struggling secretly on the brink insolvency3. A recent International Labour Organisation report4 stated that global unemployment was at 6.2%, with a further 1.5 billion people in insecure or vulnerable jobs. Although the so-called developed economies of the West account for only 15% of the earth’s working population, they accounted for 55% of the increase in unemployment between 2007 and 2010. Among 16 to 24 year olds, the jobless rate stands at 12.6%. Spain has youth unemployment of 40%, while young people in Southeast Asia and the Pacific are 4.7 times more likely to be unemployed as adults. One of the root causes of the revolution in Tunisia was the unrest caused by having a growing number of young people without jobs: the ILO estimates that in north Africa as a whole “an alarming” 23.6% of economically active young people were unemployed in 2010. “God’s work” declared Lloyd Blankfein, CEO and Chairman of Goldman Sachs5. Capital is a wrathful ‘God’ indeed. The restructurings, insolvencies and desperate but fee-generating bond issues continued into 2010. Now, however, the profitability of the surviving banks seemed to have renewed their confidence in the face of public anger. It is almost an abuse of intelligence to follow a stratagem of attack as the best defence, but there is little other way to encapsulate the modus operandi now exhibited as the states that had once hoped to ease the banking sector out of its crisis in a spirit of cooperation, suddenly found themselves sitting around a table, having terms dictated by people they had once pulled from total oblivion. And it really is dictation; subdivided into grudgingly accepted or willingly internalised – last week’s pathetic announcement by the UK government of ‘Project Merlin’ success, which caused a Liberal Democrat treasury spokesman to resign in disgust, amounted not to a punishment of banks but in fact a tax cut in their favour6. The process of restructuring through cuts and fee generation remained the same. As before, the skill was in attempting to squeeze as much as possible out of the borrower and then holding it in limbo, between insolvency and liquidation. Iceland had shown liquidation was undesirable, at least, it was not desirable yet7 – the Icelandic people had accepted collapse and were now trying on their own terms to forge a quiet and simple economy, paying back with what they had and trying to avoid advanced financialisation altogether. July 27, 2010 (Bloomberg) — Bank of America Corp., owner of the most-active subprime lender, Countrywide Financial Corp., earned $2.9 million in interest and fees for a line of credit Arizona used through June to balance a budget undermined by the housing- market collapse. New Jersey, New Hampshire and other U.S. states also needed budget-balancing help that enriched the same Wall Street firms that touched off the longest economic slump since the 1930s by packaging loans to unqualified borrowers. States issued $92 billion of long-term debt since Jan. 1, 2009, generating about $488 million for banks based on the average underwriting fee of $5.30 per $1,000 of bonds, data compiled by Bloomberg show. If it ever was otherwise, and there have been moments when the populous have carved out protections and rights to their own benefit, at some point each state came to exist for a single and solitary purpose: the sustenance of finance. The manner in which all formal elements of the political economy are now caught within a circular logic which each performs however unwillingly until death reminds one of the Medieval tradition of the ‘danse macabre’. Here high-born and low, according to the feudal hierarchy, are each arranged alternately with death’s skeletons in a dancing ring. The circle is critical in representing not just the ultimate equality of the dancers, but their turning ever round a hollow centre. 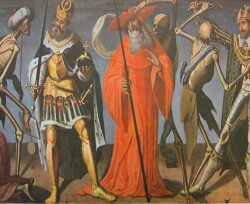 In the famed Totentanz of Luebeck the skeletons are drawn as lively participants while emperor, priest and usurer exhibit a sluggish state of narcosis. Faster and faster the tempo of the dance drives, each participating mannequin-like in the soaring intensity, unto death. Like nests of hungry owls. First faint but soon increasing. They feel a perfect pair. Which mark her Book of Prayer. To dance in perfect time. I read this article and found it very interesting, thought it might be something for you. The article is called A Short Legal History of the Credit Crunch – Part 4 of 4 and is located at http://criticallegalthinking.com/2011/02/17/a-short-legal-history-of-the-credit-crunch-part-4/.